The South Florida region generally consists of Miami-Dade, Broward and Palm Beach Counties and urban areas along the I-95 and Florida’s Turnpike corridor south from West Palm Beach to Miami. The linear metropolitan area is bound by the Atlantic Coast to the east and the Everglades, including Everglades National Park and Big Cypress National Preserve, to the west. Suburban expansion has used most undeveloped land in South Florida. However, pressure to expand west has continued to grow as the population pushes outward. Retirees, immigrants, beach worshipers, and business people have all migrated to South Florida as a place of opportunity. Since new development anywhere west of the turnpike is more likely to require wetland displacement, most growth has focused on in-fill development or the reuse of existing properties. Interstate 75 and U.S. 41 are two of the few routes that approach South Florida from the west. South Florida has some of the most spectacular beaches in the United States, and Miami Beach is one the most well-known beaches in the world. The wide beach there is known for its colorful buildings, walkable storefronts, and culturally diverse restaurants. It is not uncommon to see people dressed lavishly in Miami Beach, and the 1996 movie The Birdcage shows off some of the outstanding architecture of the city’s Art Deco District. Downtown Miami is its own cultural mecca, with a multitude of shops and restaurants along Calle Ocho southwest of Downtown. Several condominium high rises line Biscayne Bay in the vicinity of the financial district. American Airlines Arena, home of the Miami Heat, also resides along Biscayne Boulevard at the intersection of U.S. 1 (Biscayne Boulevard) and SR 886 (Port Boulevard). The venue is located next to the walkable Bayside Marketplace mall and Museum Park, all accessible by car via U.S. Biscayne Boulevard and Interstate 395 as well as the Metrorail, which extends north roughly along Florida 933 (NW 12th Avenue). The cheapest way to fly into Miami may not be through Miami International Airport (MIA), although that airport serves as the primary gateway from the United States to Latin America and the islands of the Caribbean Sea. For those arriving from other U.S. destinations, it is worthwhile to compare fares with Fort Lauderdale International Airport (FLL). The lower fares are largely due to the fact that most low-cost carriers fly into Fort Lauderdale instead of MIA. In addition to air travel, Miami is internationally known as a major seaport. Many cruise ships depart the Port of Miami daily, leaving for destinations such as the Bahamas, the Virgin Islands, the Panama Canal, and South America. Cruise ships also dock at Port Everglades, located northeast of FLL Airport and east of I-595. Several toll roads in the Miami-Dade metropolitan area are managed by the Miami-Dade Expressway Authority. These include the Airport Expressway (SR 112), the Dolphin Expressway (SR 836) and Gratigny Parkway (SR 924) among others. The agency formed in 1994 to improve traffic flow on these expressways, each of which is a significant aspect of the regional freeway network. Nick Stearn provided the site with a general overview of the street numbering system for the Miami-Dade Metropolitan area. South of Flagler Street, the road dividing north and south addresses, and Miami Avenue, the road dividing east and west addresses, every half-mile is a through road. The east-west roads are divided into groups of eight, with 1/16 mile between streets. This is why SW Eighth Street (U.S. 41) is a major through road. Avenues (north-south) are 1/4 mile apart and have a similar pattern, going by fives and starting with (N/S) West Second Avenue. The sequence continues through Seventh Avenue (U.S. 441), 12th Avenue, 17th Avenue, etc, with each also a half mile apart. Except in extreme western areas, streets always follow this pattern. Krome Avenue (SW/NW 177th Avenue, Florida 997) generally represents the western most extent of the built up area by the Everglades, with the exception of areas around Homestead. The only real exceptions to the street numbering system in Miami-Dade County are Coral Gables and Hialeah, which use their own numbering systems. 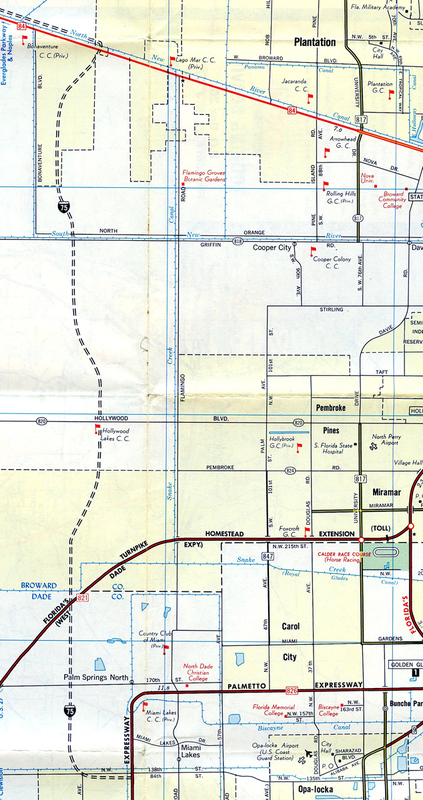 The main streets and avenues follow the same patterns, but have different numbers than the county. NW 42nd Avenue (LeJeune Road) becomes East 8th Avenue in Hialeah and loses its number in Coral Gables, but forms the 400 block. For purposes of consistency, the county-wide designations are posted at major intersections. Homestead also has its own numbering system. A peculiarity of this is that the avenues in the southwest quadrant almost always lose a number in regular intervals immediately to the east of the main arterials. The pattern is usually 0, 2, 3, 4, 5, 7, 8, 9. The relative uniformity of this system leads to three-digit numbers in the southern and western portions of the county. The street numbering format in Broward County is completely different, with each city utilizing its own system. Interstate 75 provides one of two routes from South Florida west to Southwest Florida. Traversing the Everglades along Alligator Alley (Everglades Parkway), I-75 travels east from Naples and Collier County to U.S. 27 and Weston in Broward County. A systems interchange joins the freeway with I-595 (Port Everglades Expressway) east to Fort Lauderdale and the tolled Sawgrass Expressway (SR 869) north to Coral Springs. I-75 turns south from the exchange through Davie, Southwest Ranches, Pembroke Pines and Miramar before crossing into Miami-Dade County. The final 5.44 miles of Interstate 75 form an L-shaped route south to Hialeah and east to SR 826 (Palmetto Expressway). The freeway ends opposite SR 924 (Gratigny Parkway), a toll road leading east to Opa Locka. Planning for the extension of I-75 south from Tampa and St. Petersburg included a corridor overlaying U.S. 41 east from Naples to Miami. That route would have been costly due to environmental impacts and right of way needs along U.S. 41 through the urban area to Interstate 95. 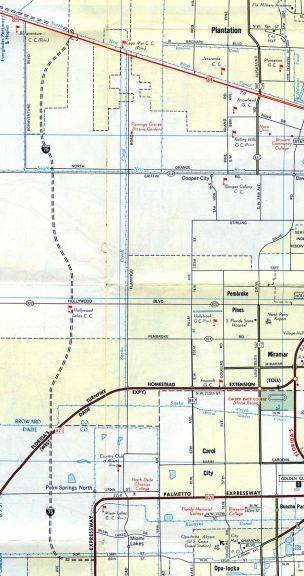 This 1976 General Drafting map shows the final alignment proposed for I-75 through eastern Broward and northern Miami-Dade counties. Interstate 95 is the major north-south freeway in the Miami metropolitan area. Approaching the city from the north along the Atlantic coastline, Interstate 95 has six to eight lanes as it connects West Palm Beach, Boca Raton, Fort Lauderdale, Hollywood and Miami. Once within Downtown Miami, Interstate 95 connects to several spur routes to various destinations within the city, including Interstates 195 and 395 and the Downtown Distributor (SR 970). Interstate 95 ends with U.S. 1 continuing south onto Dixie Highway toward Coral Gables, Homestead and the Florida Keys. Interstate 195 is a short east-west spur route connecting Interstate 95 in the west with Miami Beach in the east via the Julia Tuttle Causeway. It seamlessly connects with the Airport Expressway (Florida 112) at the Midtown Interchange with I-95. Florida 112 is the unsigned counterpart to I-195. It extends east from the freeway end at Florida 907 in Miami Beach to Florida A1A (Collins Avenue). Florida 836 is the Dolphin Expressway connecting Florida’s Turnpike in the west with Interstate 95 in the east. Previously only tolled in the eastbound direction, the expressway uses all electronic tolling as it connects Downtown Miami with Miami International Airport (MIA). The freeway gains Interstate status east of Interstate 95, but ends before changing into MacArthur Causeway (Florida A1A) that leads to Miami Beach. Florida 836 is the hidden designation for the short Interstate 395. At the western end of Florida 836, an extension opened in 2007 from the Homestead Extension to U.S. 41 via Florida 825 (SW 137th Avenue). Florida’s Turnpike (Florida 91) parallels Interstate 95 southward from Fort Pierce in Martin County through to Palm Beach and Broward Counties. The mainline spurs south to the Golden Glades Interchange with I-95 and Florida 826 (Palmetto Expressway). The Homestead Extension (Florida 821) continues the mainline mileage west along the Miami-Dade County line and south to Homestead and Florida City in south Miami-Dade County. Construction adds Express Lanes to the Homestead Extension. Motorists using these lanes will bypass most local exits, but at a higher toll rate than charged in the general travel lanes. The Airport Expressway extends west from Interstates 95 and 195 at the 36th Street Interchange to Miami International Airport (MIA) and SR 953 (SW 42nd Avenue). As of 2014, tolls are charged in both directions of SR 112. The Airport Expressway uses all electronic toll collection via Sunpass or toll by plate. One of the oldest freeways in Miami-Dade County, SR 826 is the Palmetto Expressway. The busy commuter route forms a loop around Miami. The north-south leg originates at U.S. 1 in Kendall and travels north along the west side of Miami and Miami International Airport (MIA) and through Hialeah and Miami Lakes. The east-west section passes through Miami Gardens, north of Opa-Locka, to connect with Interstate 95, U.S. 441 and Florida’s Turnpike at the Golden Glades Interchange. Florida 826 continues east from the Golden Glades Interchange along NE 167th Street through North Miami Beach to NE 163rd Street and U.S. 1 (Biscayne Boulevard). The state route concludes at SR A1A (Collins Avenue) in Sunny Isles Beach. A direct ramp links Dadeland Mall Circle with SR 826 (Palmetto Expressway) north at Kendall. Photo taken 12/28/03. Florida 836 emerges from Interstate 395 at the Midtown Interchange with I-95. Lining the tolled Dolphin Expressway, Florida 836 travels west to Miami International Airport (MIA), Sweetwater and NW 137th Avenue at the University Park community. The extension west from Florida’s Turnpike Homestead Extension to SR 825 (NW 137th Avenue), north of U.S. 41 and the Tamiami Lakes neighborhood, opened to traffic in 2007. Like the parallel Airport Expressway to the north, tolls charged on the Dolphin Expressway use all electronic toll (AET) collection with SunPass and toll by plate options. The Sawgrass Expressway constitutes a 20-mile toll road looping north from I-75 and I-595 at Sunrise to Tamarac and Coral Springs and east to Parkland, Coconut Creek and Deerfield Beach. Tolls are collected electronically, and express lanes are planned. Just east of Florida’s Turnpike (SR 91), SR 826 transitions onto SW 10th Street, a surface arterial extending east through Deerfield Beach to Arlington Park, Shorewood and U.S. 1 (Federal Highway). SR 874 angles northeast from Florida’s Turnpike – Homestead Extension to SR 826 (Palmetto Expressway) near Kendall. The tolled commuter route also connects with the Snapper Creek Expressway east to South Miami. Tolls are collected electronically by Sunpass or toll by plate. The Snapper Creek Expressway is an east-west connector linking SR 874 (Don Shula Expressway) with U.S. 1 (Dixie Highway) at Kendall. The toll road is maintained by the Miami-Dade Expressway Authority. It uses all electronic toll collection. Gratigny Parkway is a toll road extending east from the ending Interstate 75 and Palmetto Expressway (SR 826) to the city of Opa-Locka and NW 119th Street. SR 924 also follows NW 119th Street east to I-95 and the cities of Biscayne Park and North Miami. Florida 970 is the Downtown Distributor, a series of ramps connecting Miami’s Central Business District with Interstate 95 just north of its end. U.S. 1 follows the Downtown Distributor as part of its 2013 relocation away from Brickell Avenue south of the Miami River. The US highway however remains unsigned along Florida 970 as of summer 2017. U.S. 1 is Biscayne Boulevard through Miami, and it is variably known as Dixie Highway and Federal Boulevard in other parts of South Florida. Replaced by I-95 as the primary north-south route through Broward and Miami-Dade Counties, U.S. 1 remains well traveled, providing connectivity to the various municipalities throughout the region. Florida A1A loops east in segments from U.S. 1 as the alternate to the highway mainline. Florida 5 is the counterpart for U.S. 1 south to the Overseas Highway, which leads U.S. 1 southwest to Key West. U.S. 27 enters the Miami metropolitan area from the northeast, having traveled south through the middle of the Florida peninsula southward from Clermont, Haines City and Sebring. The majority of the route through the Sunshine State is a four to six-lane divided highway. Encircling the south side of Lake Okeechobee between Clewiston and South Bay, U.S. 27 emerges along a rural route through sugarcane fields and northern reaches of the Everglades onto Okeechobee Road. Through Miami-Dade County, U.S. 27 turns southeast along Okeechobee Road through Hialeah Gardens, Medley and Hialeah. The final stretch lines NW 36th Street, paralleling SR 112 (Airport Expressway) east into Miami. The route ends at U.S. 1 (Biscayne Boulevard) along side Interstate 195. U.S. 41 enters the Miami metropolitan area from the west, following the historic Tamiami Trail, which is a play on the names of Tampa and Miami. U.S. 41 connects these two cities via Sarasota, Fort Myers and Naples. Replacing the historical designation of U.S. 94 between Naples and Miami, U.S. 41 travels east-west across the Everglades and into the western suburbs. SW 8th Street leads U.S. 41 east along an increasingly urban route to Sweetwater, West Miami and Coral Gables. U.S. 41 ended just east of I-95 at Brickell Avenue until 2013, when U.S. 1 was relocated away from Brickell Avenue. Although still unmarked as of summer 2017, U.S. 41 was extended slightly further along Brickell Avenue north across the Miami River to SE 3rd Street, where U.S. 1 resumes along its original route east from the Downtown Distributor (SR 970). Previously, U.S. 41 overlapped with U.S. 1 north along Biscayne Boulevard to the MacArthur Causeway (SR A1A) out to Miami Beach. U.S. 441 branches south from U.S. 98 in Palm Beach Garden, following a six-lane arterial route through to Broward County between Parkland and Coconut Creek. Southward through Margate, North Lauderdale and Plantation, U.S. 441 generally consists of a heavily developed commuter route. Paralleling Florida’s Turnpike, U.S. 441 continues south through Davie, Hollywood and Miramar into north Miami-Dade County. U.S. 441 meets the turnpike at its south end as part of the Golden Glades Interchange with SR 826 (Palmetto Expressway) and Interstate 95. NW 7th Avenue leads the remainder of U.S. 441 south in close proximity to I-95 through the city of North Miami and Miami through to its terminus at U.S. 41 (SW 7th/SW 8th Streets). Florida A1A (Collins Avenue) is the main coastal route through Miami Beach. Made famous by its seaside routing, Florida A1A consists of a segmented route that provide scenic alternatives to U.S. 1. The section in Miami-Dade County originates at U.S. 1 and I-395 north of Downtown Miami. It follows MacArthur Causeway east to Miami Beach and Collins Avenue north from there. Florida A1A connects Surfside, Sunny Isles Beach and Golden Beach to the Broward County line. The ensuing drive takes the state road through Hallandale Beach and Hollywood to Dania Beach Boulevard, which leads the route inland to U.S. 1 (Federal Highway) in Dania Beach. Throughout most of Florida, SR 9 is the hidden counterpart to Interstate 95. Southwest from the Golden Glades Interchange, the state route emerges as a stand along route to Opa-Locka and NW 27th Avenue. NW 27th Avenue extends SR 9 south into central Miami to U.S. 1 (Dixie Highway). A 10.70-mile route, Florida 94 is located entirely within Miami-Dade County. The state road follows Kendall Drive / SW 88th Street between Florida 997 (Krome Avenue) and U.S. 1 (Dixie Highway) at Pinecrest. Passing south of Dadeland Mall, Florida 94 (SW 88th Street) intersects U.S. 1 beyond a Metrorail viaduct. Photo taken 12/28/03. Ramps from Dadeland Mall and SR 94 (SW 88th Street) converge ahead of the Palmetto Expressway (SR 826) north. Photo taken 12/28/03. Florida 817 is University Drive from Florida 9 (Unity Boulevard) in Miami-Dade County just south of Miami Gardens, north to Florida 869 (Sawgrass Expressway) in Coral Springs. The state road is multilane, divided for its entire length. A flyover ramp links SR 817 (University Drive) north with I-595 (Port Everglades Expressway) west. Photo taken 12/28/03. The connection to I-595 east toward Fort Lauderdale from SR 817 (University Drive) north uses the nearby on-ramp from SR 84. SR 84 comprises the frontage road system for the Port Everglades Expressway across Broward County. Photo taken 12/28/03. SR 817 (University Drive) south at the flyover for I-595 east to Fort Lauderdale and Fort Lauderdale-Hollywood International Airport (FLL). Photo taken 12/28/03. SR 817 crosses a canal and intersects SR 84 west. There is no direct access to Interstate 595 west from University Drive. Instead drivers are directed west along SR 84 to the on-ramp past Pine Island Road. Photo taken 12/28/03. Florida 818 is Griffin Road from Florida 823 (Flamingo Drive) at Cooper City east to U.S. 1 in Dania Beach. SR 818 (Griffin Road) west at SR 817 (University Drive) in the town of Davie. Griffin Road extends west as a state road to SR 823 (Flamingo Road), and a local arterial to I-75 in Weston. Photo taken 12/28/03. Florida 822 follows Sheridan Street through Hollywood. The 5.79 mile state road begins at U.S. 441 and ends at SR A1A. Florida 822 (Sheridan Street) crosses the Stranahan River and ends at Florida A1A across from Hollywood North Beach Park. Photo taken 01/06/01. Sheridan Street west at the diamond interchange with Interstate 95 in Hollywood. Photo taken 01/06/01. Interstate 95 heads south from SR 822 (Sheridan Street) and the city of Hollywood to Pembroke Park and Hallandale Beach. Photo taken 01/06/01. Florida 823 begins at U.S. 27 (Okeechobee Road) in Hialeah, then travels 9.70 miles north to Miami Lakes and Miami Gardens along NW 57th Street to the Broward County line. The state road shifts westward through Miramar and overtakes Flamingo Road north through Pembroke Pines, Davie and Cooper City before ending at I-595 and Florida 84 at Plantation. SR 823 (Flamingo Road) north at SR 84 east. SR 84 parallels as the Port Everglades Expressway frontage road system, providing local access to and from I-595 from intersecting north-south arterials. Photo taken 12/28/03. SR 838 is Sunrise Boulevard, which formerly began at SR 869 (Sawgrass Expressway) near Sawgrass Mills mall in Sunrise. SR 838 travels 8.16 miles east along Sunrise Boulevard from SR 817 through Sunrise Heights in Plantation, Lauderhill and Washington Park to U.S. 1 in Fort Lauderdale. Beyond an overlap with U.S. 1 by Holiday Park, SR 838 (Sunrise Boulevard) extends another 1.19 miles to SR A1A (Fort Lauderdale Beach Boulevard) on the coast. Florida 838 (Sunrise Boulevard) passes above U.S. 441 at a diamond interchange between the two arterials. Photo taken 12/28/03. Entering the city of Fort Lauderdale, SR 838 (Sunrise Road) east elevates across a frontage road and an AMTRAK line to meet Interstate 95. Photo taken 12/28/03. SR 845 (NW 9th Avenue) stems north from SR 842 in Fort Lauderdale to intersect SR 838 (Sunrise Boulevard) en route to the city of Oakland Park. Photo taken 12/28/03. Florida 842 travels 7.17 miles along Broward Boulevard from Florida 817 (University Drive) in Plantation east to U.S. 1 in Downtown Fort Lauderdale. Another 1.41 mile segment of Florida 842 lines Las Olas Boulevard in Fort Lauderdale, from SE 16th Avenue to Nurmi Isles and Florida A1A (Fort Lauderdale Beach / Seabreeze Boulevards). Florida 842 (Las Olas Boulevard) concludes eastbound at the one-way couplet of Florida A1A (Seabreeze Boulevard south / Fort Lauderdale Beach Boulevard north). Photo taken 12/28/03. An east-west arterial route, SR 860 follows NW 186th Street from I-75 to NW 67th Avenue / Ludlam Road, and NW 183rd Street from there into the city of Miami Gardens. The 12.98-mile route meanders east to North Miami Beach along a combination of NW 185th and NW 186th Streets between I-95 and its end at U.S. 1 (Biscayne Boulevard) in Aventura. Florida 860 (NW 186th Street) west ends at a trumpet interchange with Interstate 75 south of Miramar. Photo taken 12/28/03. SR 907 serves the western half of the barrier island city of Miami Beach along Alton Road. A 0.41 mile segment loops east of the interchange with I-195, intersecting SR 112 (Arthur Godfrey Street) at-grade while the SR 907 mainline connects with ramps to Julia Tuttle Causeway west to Miami. The state road otherwise totals 5.66 miles between SR A1A (MacArthur Causeway) by South Beach and SR A1A (Collins Avenue) east of the La Gorce neighborhood. Shield assembly formerly posted along Alton Road south at SR 112 (W 41st Street) and the beginning of Interstate 195 (Julia Tuttle Causeway). Photo taken November 1999. Rickenbacker Causeway, a toll bridge connecting Miami with Virgina Key and Key Biscayne, was a part of SR 913. Only a 0.373 mile segment of SW 26th Road, from SW 1st Avenue and I-95 & U.S. 1, to the bridge approach remains in the state system. SR 933 follows SW 12th Avenue north from SR 972 (SW 2nd Street / Coral Way) to SR 112 (Airport Expressway) for 4.25 miles in Miami. The remainder of the route along NW 12th Avenue to SR 934 (NW 79th / 81st Street) near El Portal was decommissioned. SR 948 is a divided arterial connecting SR 826 (Palmetto Expressway) at Doral to the west with SR 112 (Airport Expressway) and U.S. 27 (Okeechobee Road) to the east. The 4.00-mile long urban route runs along the north side of Miami International Airport (MIA) through Virginia Gardens and Miami Springs. LeJeune Road leads SR 953 11.74 miles north from U.S. 1 (Dixie Highway) in Coral Gables to SR 916 (NW 135th Street) in Opa-Locka. The urban arterial connects with Miami International Airport (MIA) from west Miami and Hialeah while also linking SR 836 (Dolphin Expressway) with SR 112 (Airport Expressway). SR 972 totals 4.16 miles along an urban route east from SW 37th Avenue / Douglas Road, 0.51 miles east of SR 953 (LeJeune Road), to Brickell Avenue (former U.S. 1) in the city of Miami. The route previously extended west along SW 24th Street / Coral Way to the Palmetto Expressway (SR 826) near West Miami. SR 933 leads north from SR 972 (SW 2nd Street) along SW 12th Avenue between The Roads and Shenandoah communities. Photo taken 12/28/03. Florida 972 angles northeast along SW 3rd Avenue to Brickelll while SR 933 begins northbound along SW 12th Avenue toward Little Havana. Photo taken 12/28/03. Continuing east from Florida 933, Florida 972 follows SW 3rd Avenue, a banyan tree-lined boulevard with a wide landscaped median. The confirming marker posted ahead of SW 31st Road was removed by 2014. Photo taken 12/28/03. A second reassurance marker for SR 972 east along SW 3rd Avenue was removed after 2014. A bike lane sign stands in place of the shield now. Photo taken 12/28/03. A trailblazer for I-95 previously directed traffic from SR 972 (SW 3rd Avenue) east onto SW 25th Road south. This assembly was removed during redevelopment of the adjacent parcel by 2007. Photo taken 12/28/03. S.W. 25th Road connects Florida 972 with a half diamond interchange to I-95 north adjacent to Rickenbacker Causeway. Photo taken 12/28/03. SR 972 begins and leads west from Brickell Avenue (former U.S. 1) along SW 13th Street. The state road first intersects South Miami Avenue. Photo taken 12/28/03. The first reassurance shield for SR 972 west appears beyond South Miami Avenue on SW 13th Street. Photo taken 12/28/03. Replaced shield assembly on NE 2nd Avenue south at NE 12th Street. The westbound on-ramp to I-395 and the Dolphin Expressway (SR 836) departs in one block. Photo taken 12/28/03. Paralleling the MetroMover south from I-395, NE 2nd Avenue intersects NE 10th Street east to adjacent U.S. 1 (Biscayne Boulevard). Photo taken 12/28/03. NE 8th Street east at U.S. 1 (Biscayne Boulevard) and American Airlines Arena. Photo taken 12/28/03. NE 12th Avenue partitions into separate ramps for I-395 leading to the nearby Midtown Interchange with SR 836 (Dolphin Expressway) west and Interstate 95. Photo taken 12/28/03. South Miami Avenue crosses the South Miami River on a four-lane draw bridge. Photo taken 12/28/03. Page Updated February 9, 2018.